Sweating, trembling, sometimes experiencing nausea and vomiting – these are some of the things experienced by people with nyctophobia. Also known as the irrational fear of the dark, nyctophobia can cause someone to avoid dark places. It still remains as one of the most common fears of children. This intense fear of the dark can also affect adults, causing problems in sleeping and avoidance of night routines. Published by Hypnosis in London on 26 September 2016, written by Malminder Gill. Many children are afraid of the dark. In fact, it is estimated that about 90% of children have this kind of fear. This fear can be caused by traumatic experiences or by another mental health problem. In one study published in the Social Psychiatry and Psychiatric Epidemiology journal, it suggests that traumatic experiences such as difficult to control childhood experiences can trigger the onset of phobia. The intense fear of the dark can be brought about by distressing or traumatizing events that are related with darkness. 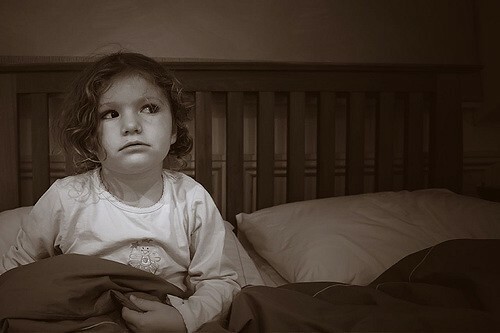 A person with nyctophobia may have experienced as a child being punished or abused in a dark room. These distressing events can instill bad memories with night or darkness. Other mental health illness such as depression may lead to anxiety disorders like phobias. Studies show that people with clinical depression also show symptoms of anxiety disorders. Mayo Clinic experts believed that anxiety may occur as a symptom of depression. The symptoms of nyctophobia vary depending on age. Preschoolers who have intense fear of the dark may resort to thumb sucking and bed wetting. Thumb sucking is a normal behavior for babies. But this slowly goes away after the age of 6 months. Kids who end up with a habit of thumb sucking do it to ease themselves. It can be because they’re bored, afraid, or hungry. Aside from thumb sucking, kids who experience intense fear of the dark may also resort to clinginess and difficulty falling asleep without a night light or a companion. Those who are not able to overcome this fear may grow up as adults bringing along this fear. Adults with nyctophobia may experience sleep and eating problems. When left in a dark place, they may exhibit physical symptoms like rapid shallow breathing, heart palpitations, chest pain, and may shiver or tremble as a result of intense fear. They may also have thoughts of dying or feeling dread. Like other people with phobia, those with nyctophobia know that their fear is irrational but feel like they can’t do something about it. They feel powerless in overcoming their fear and a sense of impending doom usually prevails them. However, this can be overcome through different forms of therapy. Talk therapy or psychotherapy is a form of therapy usually advised for people with anxiety disorders. In order to be effective, the psychotherapist must address the specific anxiety of the person. Cognitive behavioral therapy (CBT), an example of psychotherapy, has the potential in modifying the neural circuitry of those with anxiety disorders. For phobias like nyctophobia, CBT can be a combination of cognitive therapy and exposure therapy. In cognitive therapy, the therapist assists the person in adapting to his or her thought patterns. He/she will be taught how to approach an anxiety-provoking situation. Exposure therapy, on the other hand, pertains to the systematic way of confronting the feared stimuli. It remains to be an undisputed treatment for anxiety disorders like phobias. Hypnotherapy is a form of therapy that may be used to “age regress” a person suffering from anxiety. Through hypnosis, the response of the person can be studied. It can also point out situations or thoughts that provoke such reaction. When done right, hypnosis can be a way to “age regress” a person to the time when he/she doesn’t have the phobia and the time when coping was successful. This then can be brought to one’s consciousness and be used in highly-stressful situations. Through guided hypnosis, I was able to help clients suffering from different kinds of phobia. Initially, I would be talking to the client to discuss the issue and finding out the possible root cause. The next step would be to prepare the hypnosis session based on the conversation. The following session will be the start of the hypnosis session. This is a highly personalized form of therapy. Clients can provide feedback on what works or what still need to be addressed. On the last session of hypnotherapy, it would be about tying loose ends. If you want to find out more about my practice, you can see this page or read clients’ feedback. “Nyctophobia – Scared Of The Dark”. Healthguidance.org. N.p., 2016. Web. 14 Sept. 2016. Magee, W. J. “Effects Of Negative Life Experiences On Phobia Onset”. Social Psychiatry and Psychiatric Epidemiology 34.7 (1999): 343-351. Web. 14 Sept. 2016. “The Link Between Depression And Other Mental Illnesses”. WebMD. N.p., 2016. Web. 14 Sept. 2016. ”The Link Between Depression And Other Mental Illnesses”. WebMD. N.p., 2016. Web. 14 Sept. 2016. Cold, Flu &amp; Cough et al. “Thumb-Sucking-Topic Overview”. WebMD. N.p., 2016. Web. 14 Sept. 2016. “Change The Mind And You Change The Brain”: Effects Of Cognitive-Behavioral Therapy On The Neural Correlates Of Spider Phobia”. Sciencedirect.com. N.p., 2016. Web. 14 Sept. 2016. “Handbook Of Exposure Therapies”. Google Books. N.p., 2016. Web. 14 Sept. 2016. Zimberoff, Diane. “Hypnosis In The Treatment Of Anxieties, Fears And Phobias”. Web.wellness-institute.org. N.p., 2016. Web. 14 Sept. 2016.